How can I filter the results in a nodeQuery? 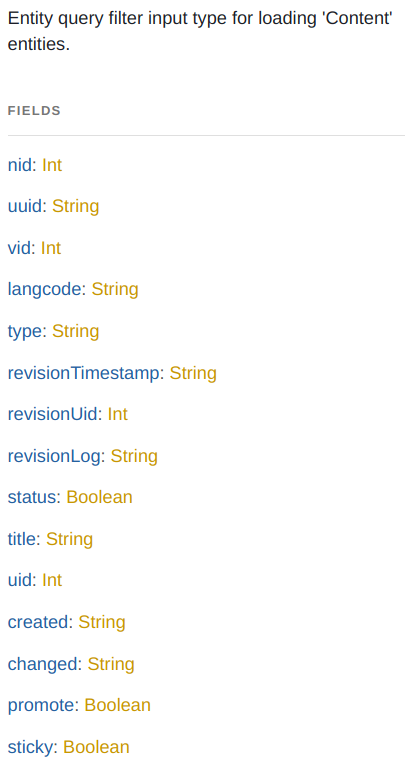 Like I would in a normal View or with the "where" clause in a SQL Statement. I noticed that it receives a NodeQueryFilterInput but I don't see how to use it. Fetching entities based on a filter or a set of filters is a common use case, so let's focus on that first. There are two ways to query the entity repository. First one would be through the entityQuery fields which are shipped with the core module but are limited in functionality. They only allow us to filter by base fields and there's no way to use an operator other than equals to. The other approach is much more powerful, as it's based on Views. It requires an additional module - graphql_views - to be installed though. Let's start with the built-in way. OUTDATED: This section is outdated, since filtering entities changed significantly. Please refer to the documentation on entity filtering with GraphQL. So it's a field (blue) with 3 arguments: offset, limit and filter (purple) which returns a value of type EntityQueryResult (all types are in yellow). The first two arguments, offset and limit, are for paging and they work the same way as in SQL. Both are integers and both have default values of 0 and 10 respectively (green). Arguments that have default values can be omitted. We'll use this feature in a while. We haven't specified the offset nor the limit, so they'll get their default values. It means that the output will contain at most 10 results, starting from the result number 0. That's cool, but what if we wanted to order the articles by node id (nid) to only show the latest articles? Or filter by tags? Or fetch the title text of an image that is attached to a media entity that is connected with the first event that starts after the article's release date? The answer is: we can do it like we'd normally do it in Drupal - with a view. Views integration has been moved to a separate project, so it has to be downloaded with composer (composer require drupal/graphql_views), from drupal.org or from github. 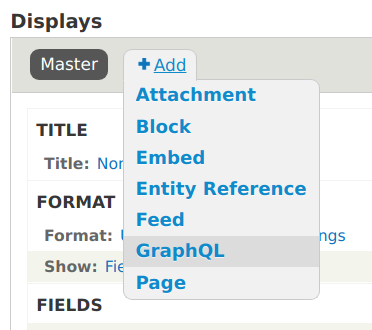 With graphql_views enabled we can add a GraphQL display to any view in the system. Now we can sort the results, filter based on content fields and add relationships. We also have the option to return either the full entities, just a selection of fields, or even search results taken straight from a search server. Views integration is a pretty broad topic, so in the next post we might try to cover it in more detail. There are quite a few more interesting aspects like sorting, exposed filters, and attaching views to entities, so we'll focus on that in an attempt to fully answer Daniel's question. For those interested in the back-end side of things I'd recommend the great Extending GraphQL series by Philipp Melab. 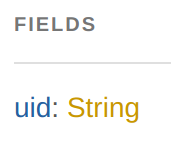 The first post that explains how to create fields is here: Extending GraphQL: Part 1 - Fields. P.S. GraphQL Views is not stable yet. In fact, two issues were spotted and fixed in the process of writing this article. If you spot a bug please report it on github or let us know in the #graphql channel at Drupal slack. These blog posts are fantastic! Would love to see these referenced and teased apart in the docs as well. Keep up the great work! 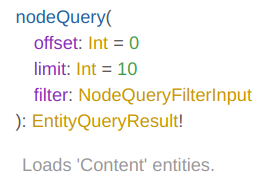 Seems like in the current version `nodeQuery.filter` expects `EntityQueryFilterInput`, not `NodeQueryFilterInput`. I'm looking for guidance on how to use this filter. 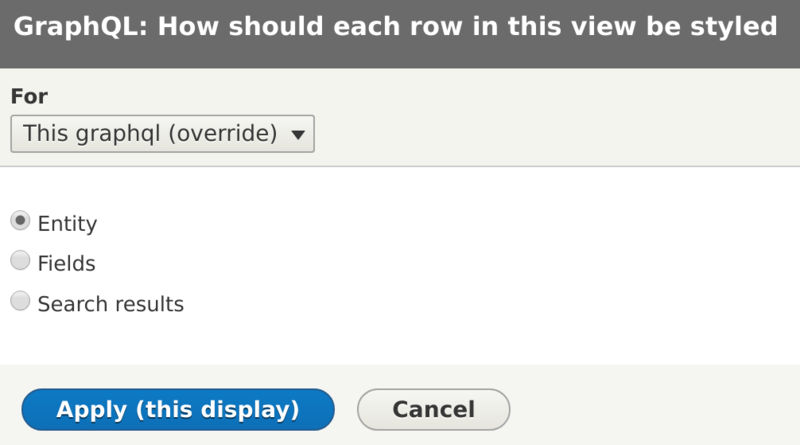 There is recent example about how to use filters in the latest version of the module.